Once you’ve crafted a unique visual brand, compiled all your IR materials, and poured hours of hard work into your IR website, you need to make sure that investors will see it. There are plenty of ways to increase website traffic, like paying for ads, but there are additional creative and organic ways to drive more activity and engagement. Read through these 7 digital advertising strategies and ask yourself if your IR website is taking advantage of these channels. Before you get too deep into digital advertising, and your own pockets, it’s important to understand the ways companies can organically grow their search traffic through SEO. First, understand the type of content and search terms that investors in your industry are using online. Then create a list of every keyword you’d ideally want to show up for on Google when someone is searching online. For example, as a gold mining company, you might consider ‘best gold stocks’ ‘gold mining investment’, ‘Canadian gold companies,’ etc. Next, analyze the content you’ve already written online, especially your IR site, and see where you can add some of those important keywords. The more keywords you can place in main headings and page titles, the better. Make sure you don’t overdo it, however, because it can negatively impact your website if Google knows you’re abusing this tactic. The more quality content you have, the more likely people will value your perspective and want to revisit your site. The same goes for search engines. A common mistake companies make is thinking they can develop lots of content quickly for clicks and lead generation. Badly planned and quickly generated content, however, will reduce your website credibility rather than help it. Always remember that search engines like Google are on the side of the consumer. They work to make the best possible experience for them–as should you. Take your time developing a good content strategy that will directly target specific audiences. Conduct research. Gather as much information as you can on your ideal target audience. People will enter their email for impeccably designed, thoughtfully presented, and well researched digital reports. Some other good examples of high quality content can include industry articles on trending topics, shareable and informative videos, whitepapers, and helpful blog posts. Make sure you remember those keywords and include them clearly in titles, headings, and body of your content. If you don’t have Google Analytics running on your corporate or IR website, go set up an account right now. It’s impossible to understand the best ways to optimize your website and your content if you don’t have actual data supporting your decisions. With Google Analytics, you don’t have to guess which keywords or ad campaigns are working best for you, and which aren’t performing as well. Using this tool, you can easily track what keywords or ads are driving the most traffic to your website, who is reading your content, where they are located geographically, and what device and browser they’re visiting from. The more information you can gather, the more you can understand the user journey, and the faster you can optimize your website experience. You might have a very strong indication on who your typical investor would be, but why not confirm that knowledge with supporting data and facts? Test one version of an ad campaign against another to see which gets more impressions and clicks. This strategy is called A/B testing. Facebook has 10 different types of ads to choose from, including carousel ads, regular image ads, and text-only ads. If your strategy is to use social ads, we suggest testing a few different types to see what data you get back. You can also create variants of the same type of ad and change up where you place the call-to-action, what color the button is, as well as what headline is more engaging. Use the data to analyze and gather the most beneficial information for your company. Just make sure when you’re A/B testing ads you only make one crucial change per set, such as placement of title. If you make multiple changes, you won’t be able to tell why one ad is performing better than the other. You can also use ad testing to serve different ads to different audiences to see what type of language sticks to different demographics. Rather than pushing people to a page where you sell a product and service, create well-designed landing pages with the specific purpose of capturing information from a prospective lead. Discuss what info is the most important to gain for your company. Typically it’s their Name and Email Address, as well as Industry (especially for public companies) and potentially Business Phone Number. The three keys of a good lead generation landing page are: A) it’s well designed B) it’s minimal and straightforward and C) it has a clear call-to-action. 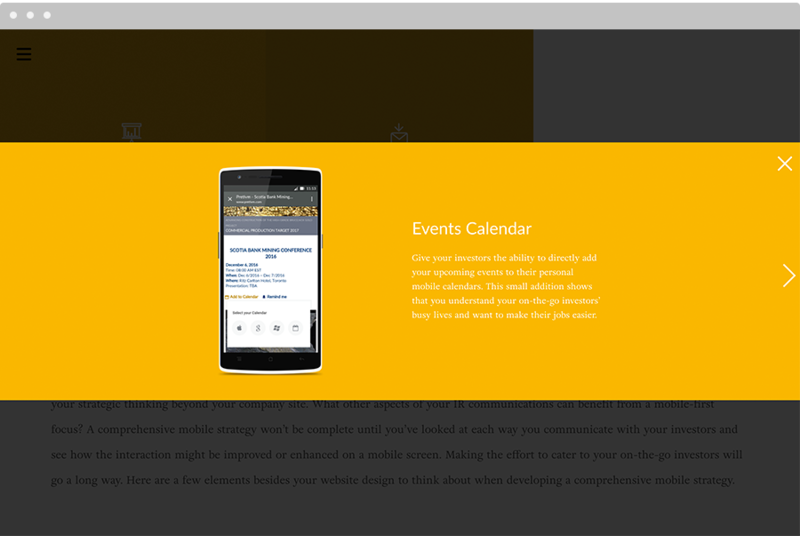 Just as we discussed above, landing pages are also a great thing to test. You can A/B test one landing page with a Name, Email, and Industry form, another with just email, and a third with the option to add a phone number or subscribe to your newsletter. You would be surprised at what discoveries people have had by understanding who their audience is what information they prefer to offer. Investors like to see that you have a good track record, and 3rd party endorsements in ads work to build trust. Experiment with different visual techniques in ads to include endorsements from reputable companies that will directly appeal to your target audience. If you’ve generated a long form report, ebook, whitepaper, or research study and want to create a little buzz around it, try creating an advanced ‘release’ landing page where people can sign up to receive notifications in their emails once the content is published. From these leads, you’ll have the ability to build targeted email lists based on who signed up for what and create more tailored content around what they’re interested in. Digital advertising is a big topic, and we know it can get overwhelming to try to choose a path that’s best, whether it’s organically growing traffic through SEO, researching PPC strategies, or focusing on creating great content. At the end of the day, all these can work, but the most important thing is to determine what your company’s goals and objectives are in order to fine-tune a digital marketing strategy. We recommend working with partners who are experts in digital marketing and advertising and who can take a deeper look at your company’s specific needs and create a step-by-step digital marketing plan. Reach out to us at any time at info@blendermedia.com to learn more. We’re halfway through the calendar year, which is about the time when companies like yours are taking stock of overall progress in 2018 – from company revenue to CSR reporting, expense reports to marketing acquisition and engagement. Optimization in all areas of your business is essential to having a strong final half of the calendar year. One particular area of your business to optimize quickly – and with clear focus – is your digital marketing strategy. Not only are your digital efforts easier to optimize in comparison to traditional marketing, digital and content marketing cost 62% less than traditional, and yields 3X as many leads. Marketing for public companies and investor relations is constantly evolving, so we’re dedicated to educating ourselves and staying on top of the industry. As we’ve moved through the first half of this year with our clients, we have identified and outlined areas to best optimize their marketing strategies and digital integration efforts. Bonus: Scroll to the end of this blog for your free downloadable report on Digital Marketing for IR – 7 Tips for 2018. Here are 3 ways to optimize your digital marketing strategy this year. There’s no doubt that video has been an important part of digital marketing for years, though it has been much more prominent and often expected as of late. Similarly, the strategic use of imagery on websites, CSR reports, annual reports, etc. has also increased viewership. The average person watches 1.5 hours of video each and every day, and with video acting as a powerful connector between company and investor, your digital strategy should also include video. Most innovative digital marketing and video strategies include VR (virtual reality) and 360º video, with companies like Teekay leading the way. Teekay has developed an impressive video strategy to tell their story through 360º videos, which allows viewers to be immersed in experiences such as being in an at-berth ship-to-ship transfer, taking a look inside a pilot’s cabin, being in a helicopter ride and other great adventures. It’s a great way for Teekay to take potential investors through their operation without needing to travel. Social media isn’t going anywhere, though the use of social media with public companies and IR has long been at odds with one another. With that said, there are plenty of investors and companies who have certainly embraced networks like LinkedIn, Twitter, and Instagram, while others are just dipping their toes in the water. These social platforms can be a great way to find potential investors for your company. Connecting with the community by perusing hashtags like #USInvestor, #investorrelations, #IRinvestment on Twitter, Instagram or Facebook, could bring plenty of accounts that could potentially engage with your business. Similarly, searching for specific companies and job titles on LinkedIn is a great tool to connect with like-minded individuals. Our free downloadable guide has great tips on how to set up your social media accounts, when to post and more. Your website is the number one driver of online engagement with your brand – it’s a 24/7 representation of your business. This means website speed and performance should be top of mind. Click here to test your website performance. It’s a handy free tool from Google that will give you insights into your overall speed score, and feedback on what you can optimize to make your website load faster. As of July 9 2018, page speed on your mobile website is more important than ever when it comes to mobile search ranking. Google rolled out an update to mobile websites that makes pagespeed a ranking factor for mobile searches, so if your website is slow, you could see a decrease in organic traffic. Integrating video content in your digital marketing strategy, utilizing the power of social media and optimizing website speed and performance are three great ways to get your digital marketing strategy ready for the remainder of 2018. Enjoyed this content? Click here to download your free guide on Digital Marketing for IR – 7 Tips for 2018. When setting the marketing strategy for your business, there are many positioning strategies and tactics your public company can take. From selecting the networks on which you target investors, to the copy points and CTAs that are on your website, how you reach your investors takes plenty of planning and strategic consideration. One of the most challenging targets can often be accredited investors. Accredited investors are those who have a minimum net worth of $1,000,000. These individuals are clearly separated from the investing public, making up only 5% of the investing population. Attracting these individuals means positioning your company as one that is of specific interest to their portfolio. If your public company is revising or revisiting your strategy to position yourselves as such, here’s how you can market to accredited investors. Accredited investors know what they need and (typically) won’t be patient when searching for it. With your website being your 24/7 means of showcasing your company’s investor information – presentations, exploration highlights, stock information, financial reports and more – this information should be easy to navigate. By this, we mean that accredited investors should not need to click through layers of drop-down menus to read such information. Instead, limit this to one or two clicks to reach pertinent investor information. 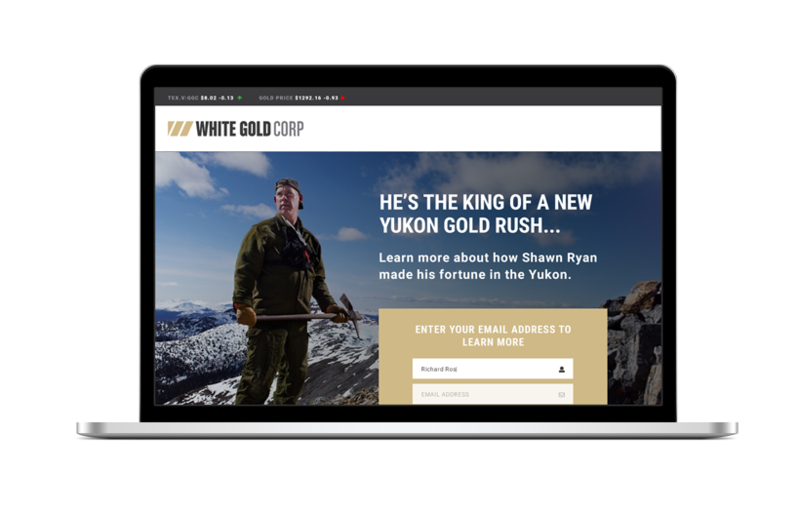 Side note: We love our work with White Gold Corp for this very reason – one or two clicks on their website to obtain presentations, highlights, reports and more. Accredited investors want to know how their money will be spent, what the trajectory of the business is, profitability milestones and other such topics. Addressing information that they want to read is not only a great exercise from a business storytelling perspective (the exercise of reviewing collateral you currently have), it can also help differentiate yourself from others in your industry. Companies that are vague in sharing topics such as their business trajectory – will often struggle out against companies who are open and transparent. Business is personal. Whether you’re purchasing a brand new suit, a coffee from your local shop, or deciding to invest in a public company, it’s important for businesses to make it personal and build relationships. Developing a personal relationship or positive rapport with an accredited investor can impact whether such an individual will decide to believe and invest in your business. Take the time and invest in the effort it takes to create that rapport. 4. Understand where these investors are ‘living’. When searching for a company like yours, what are accredited investors searching for? Or when perusing networking sites, where are they ‘living’? Investors are using search engines like Google to find their next portfolio additions. Here’s a great resource on optimizing your IR website for search traffic. When determining what accredited investors are searching for, take Google Analytics into consideration – what are the top organic search terms driving traffic to your website? What are visitors engaging with when they arrive on your website? Where are they dropping off? Similarly, LinkedIn is a network to certainly pay attention to, with 45% of LinkedIn users earning over $75,000 annually, and 133M+ living in the United States. As a professional business network, this is certainly one to consider as part of your social media strategy. 5. Referrals are the greatest form of flattery. Digital strategy aside, the greatest form of flattery is a referral. A referred client has a 16% higher lifetime value than a non-referred customer. More often than not, referrals need to be requested. Referrals can come through networking opportunities or asking your contacts if they have an accredited investor in their portfolio who is interested in partnering with a company in your industry. Consider the alternative, too – give and you shall receive. One of the most powerful ways you can generate referrals is to give them yourself. Is there an investor you wish to endorse on LinkedIn? Introduce to another public company? Refer platforms to? Consider the appreciation of a referral from an alternative perspective. Above all, marketing to accredited investors can take time, patience and the ability to develop an engrained personal relationship. Revising your 2018 strategy with this in mind could yield benefits in the long run. With the New Year right around the corner, many IR companies are putting the finishing touches on their digital strategies for 2017. Budgets have been approved and wish lists received, meaning that now is the time when the tactics are being throughly reviewed and targets set for the upcoming year. You’ve likely spent time researching the latest digital marketing trends (mobile, mobile, mobile), and have been dissecting predictions yourself for the last few months; however, as we inch closer to the New Year, digital predictions are becoming that much more clear, with key trends emerging in the online space. We’ve spent time surveying the industry and have determined our top five trends heading into 2017. So, grab a cup of coffee, open your 2017 Digital Marketing Strategy, and consider affirming (or making tweaks!) now, before we get into the Holiday Swing. 1. Your target investor wants personalized content. In recent years, companies have been developing more content for their websites; blogs, infographics, eBooks and more have filled the pages of content strategies globally. Now, your target persona wants content – but they want personalized content. With 40% of businesses taking a strategic approach to content, the time is now for your IR company to shine. By personalized, we mean using content like the aforementioned blogs, infographics, eBooks and more that is suited and targeted to your potential investor. For example, you could create a white paper or case study for a particular segment of your target, like mining. You would then serve this content through an email newsletter or targeted advertising to mining contacts exclusively. Not only does it provide valuable and worthwhile content to your potential investor, it makes him or her feel like your company is taking their wants and needs into consideration. 2. Design for multi-platform users. It’s clear that more and more digital consumers are using multi-platforms to view content online; that is, they have indicated use of mobile, desktop, tablets and more on a frequent basis. Users are coming to your website from a variety of sources, and likely using other devices at various times to return to your website. This means that instead of thinking mobile-exclusively, consider the benefits of building for multi-platform. Run an audit of your website – is it responsive on desktop, mobile and tablets? What about iPhone VS Android? Is there room for improvement? 3. Remember, your target users on are other sites, too. While the main objective is to drive potential investors to your website, remember that your target investors are on other sites, too. Primarily, consider the benefits of having active profiles on social accounts, like LinkedIn and Twitter, for example, or perhaps Facebook Groups to peruse for your benefit. Facebook is the leading social network as of Q2 2016, with 1,590,000 million active users and an 18% market share of social media networks. 4. Mobile marketing SEO will break you apart from competition in 2017. When it comes to digital trends in 2017, SEO might very well take the cake for generating the greatest impact. Google has announced a plethora of updates to search engine optimization in 2017, but the one you primarily need to focus on is around Accelerated Mobile Pages. Accelerated Mobile Pages (or AMP) is a project from Google and Twitter that is designed to make really fast mobile pages. At its core, it’s basically a stripped-down form of HTML. Anything you can do to help speed the load of your web and mobile pages will significantly help in keeping users on your site. The AMP project from Google and Twitter is performing so well, we predict that this will start to have a real impact on SEO moving into 2017. Make sure AMP pages are on your digital task list for the New Year. 5. Nurture your current IR leads. Nurturing your leads, either through email newsletters or 1:1 contact, is a necessity in 2017. Much like personalizing your content, it’s more important than ever to keep in contact and deliver the content your potential investor needs. 2017 is the year of reliance on big data and CRM software, so be sure you have the budget and systems in place to start (or continue) your email nurturing strategy. By keeping in contact with leads who have not yet converted to an investor, your company can stay top of mind in 2017. There are big changes in store for the year ahead, and it’s clear that digital marketing will play a significant part in the success of businesses globally. Through these digital marketing trends and predictions, review your current strategic plan and consider the areas you can expand on or update. Above all, we wish you and your team a joyous Holiday Season and a successful New Year! Questions about these digital marketing trends and predictions for 2017? Contact us here. On April 21 2015, businesses everywhere were watching Google search rankings intently. It was on this day that Google released an algorithmic update that revolved around mobile-friendly websites. This essentially meant that websites optimized for mobile received a boost in their mobile search results, whereas those that were not mobile-friendly dropped in their overall search rankings. ‘Mobilegeddon’ has emerged in various forms since April 21 2015. In May of 2016, ‘Mobilegeddon’ 2.0 was released; this update further increased the rankings of companies with mobile-friendly, optimized websites. Those who invested the necessary time and effort into making their sites mobile-friendly benefited from this update, whereas the businesses that did not follow the mobile-optimized trend were further dropped from the pack. That’s exactly why we paid closed attention to ‘Mobilegeddon’ in Section 2 of Connecting With Your On-The-Go Investors. Since these updates are so important to public companies, we deemed it as an integral part of our collaborative resource with CIRI. Here’s what you can expect from Section Two: The ‘Mobilegeddon’ Update. Although you now know what ‘Mobilegeddon’ is, Section Two will take you through why it was released. As Google collected web traffic and search data, they realized that more and more traffic was coming from mobile devices, primarily smart phones. To fuel a positive user experience on their network, Google announced the ‘Mobilegeddon’ change. This announcement was made in February of 2015, giving companies just three months to prepare. Google’s primary focus was to “work towards delivering high quality search results that are optimized” for mobile devices. As traffic to their network was increasing on mobile, the goal of this change was to create seamless user experiences online. What happened after The ‘Mobilegeddon’ Update? So, this begs the question – what happened after April 21 2015? What did Google look like on April 22nd? Content marketing company, BrightEdge, has tracked over 20,000 URLs since the update. They found that there was a 21% decrease in non mobile-friendly URLs on the first 3 pages of search results. Similarly, a search by s360 showed that mobile friendly websites have received 32% more organic mobile traffic than non-mobile friendly websites. Could you imagine receiving 32% more traffic to your website, simply because you made the decision to optimize your website for mobile? What does it mean for my public company? 68% of investors look at investor related content throughout the day on their mobile device, which means that nearly three quarters of traffic to your website could be coming from mobile. If your website isn’t mobile-friendly, not only will it be slammed by ‘Mobilegeddon’, your user experience will start to decline from the very moment that a potential investor visits your website. ‘Mobilegeddon’ had a significant impact on the websites of public companies, many of which are still feeling such impact on their search rankings. 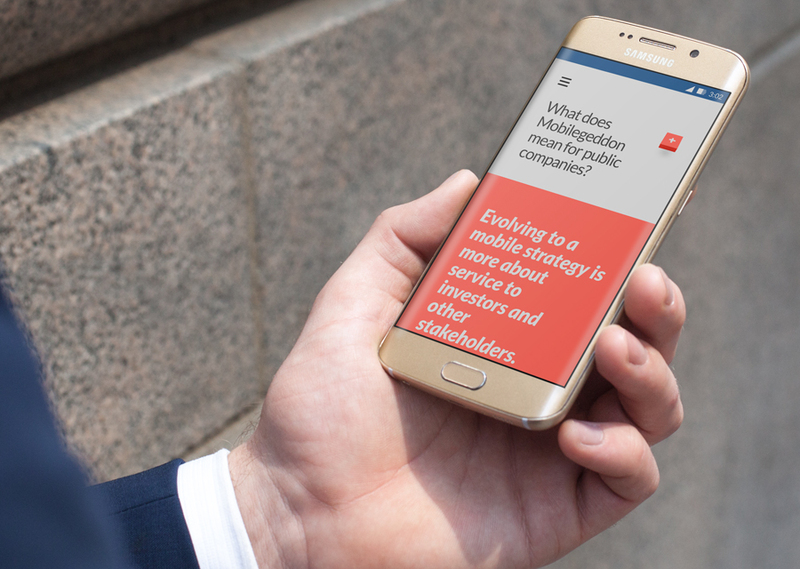 In an effort to help public companies with their website’s user experience, we made sure to include Section Two: The ‘Mobilegeddon’ Update in Connecting With Your On-The-Go Investors. With Section Two: The ‘Mobilegeddon’ Update reviewing what you need to know about Google’s change in April of 2015, we’ll follow-up next week with an overview of Section Three: Examples of Mobile-Friendly Websites. Are you reading this blog on your smart phone right now? With the number of global mobile phone users expected to pass the five billion mark by 2019, there’s a good chance you’re browsing through our site on your iPhone, Android, Windows or Pixel phone. And, when it comes to using your mobile device for work, 83% of institutional investors rely on their smart phone when it comes to decision making. That’s exactly why we released “Connecting With Your On-The-Go Investors”, in collaboration with CIRI. It’s your resource on mobile optimization – what it means, how it impacts SEO for your business, and how it is being embraced by users across Canada. It is meant to serve a go-to reference as you review your company’s IR digital and outreach strategy for 2017. So, what’s in “Connecting With Your On-The-Go Investors”? The resource is divided into five sections, with each serving a unique purpose in the process of understanding the impact of mobile on your business. Over the next five weeks, we’ll highlight each of these sections, diving deeper into what you can expect from the resource that is available now. With that said, here’s what you can expect from Section One: The Basics. What does “The Basics” of being mobile friendly actually mean? In very simple terms, being ‘mobile-friendly’ means that a website renders well on your smart phone, regardless of the device. For example, you know the pain of checking a website on mobile that isn’t optimized for your smartphone. Whether you’re filling out a contact form, or simply information-gathering, the experience can be less-than-stellar. But if that was the extent of it, we’d stop right there. How can I tell if my website is mobile friendly, and what should I do for my business? There are so many ways to test the mobile-readiness of your website; in Section One: The Basics, we’ll take you through the benefits of responsive design, and why we believe it’s the strongest option for your business. Responsive design is an approach to web design that is aimed at developing sites to provide an optimal viewing experience, both on desktop and on mobile. It makes for easy reading and navigation with a minimum of resizing, panning, and scrolling. It’s also the strongest option for your business when it comes to SEO and placement on sites like Google, which is integral to IR and decision making versus competitors. So, if your website isn’t ready for smart phone users, it’s important that you take responsive design into consideration as you plan for your IR strategy in 2017. Throughout this collaborative resource, “Connecting With Your On-The-Go Investors”, we’ll take you through the importance of building a website that caters to your business persona, and leave you with tips you can implement now to build a stronger brand presence online. With Section One: The Basics setting the stage for what is to come, we’ll follow-up next week with an overview of Section Two: The ‘Mobilegeddon’ Update.